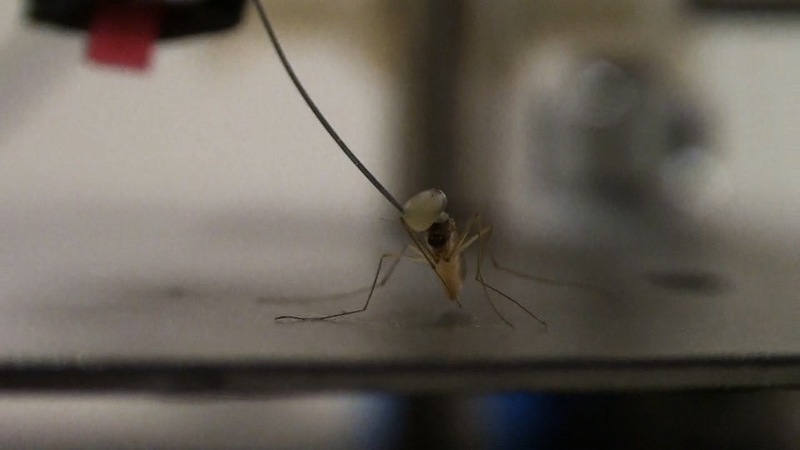 In their seminal paper "Flying in Tune: Sexual recognition in mosquitoes", Gabrielle Gibson and and Ian Russel from the University of Greenwich discovered an inspiring phenomenon: male mosquitoes change their buzzing frequency to match that of a female mosquito. This synchronization brings their wing beats to within a millisecond or less of one another. 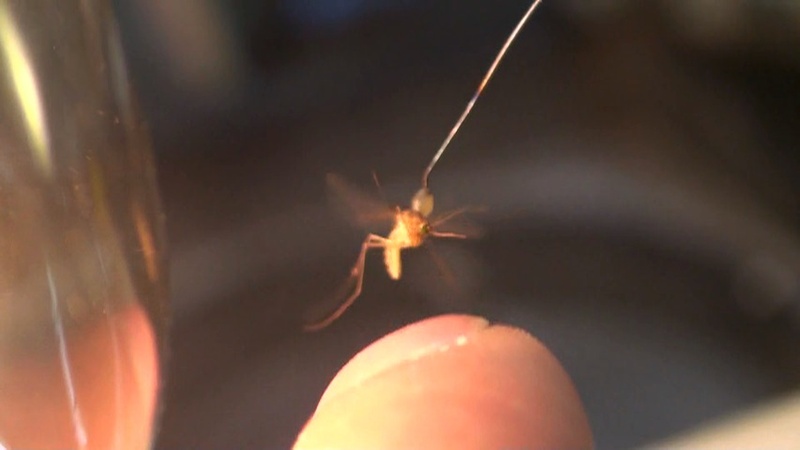 The authors suggest that this phenomenon facilitates the mosquitoes' ability to copulate mid-flight. We take advantage of this phenomenon to engage the mosquitoes in song, inspired by the North Indian classical vocal tradition of Dhrupad. 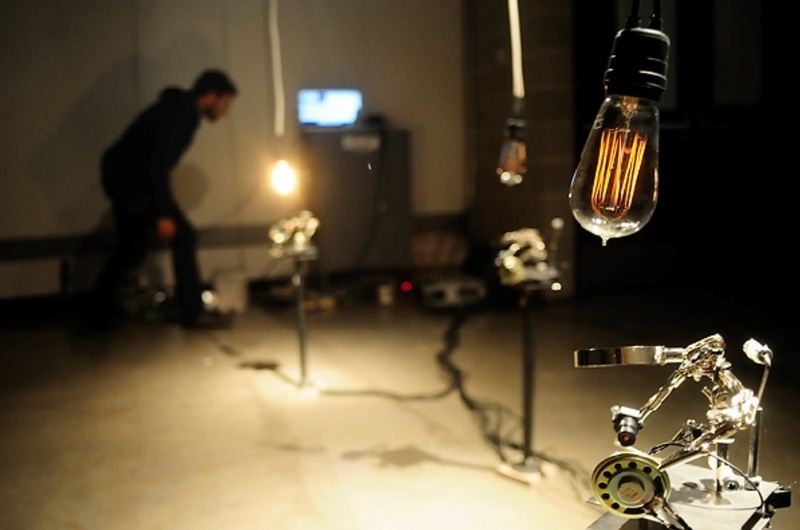 Our installation explores reciprocal musical interactions between the mosquito and the computer. 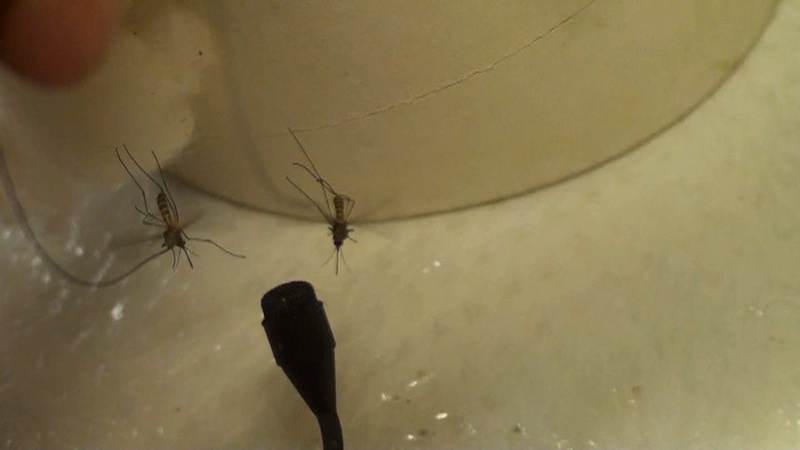 The computer produces a stimulus signal to which the living mosquitos synchronize. 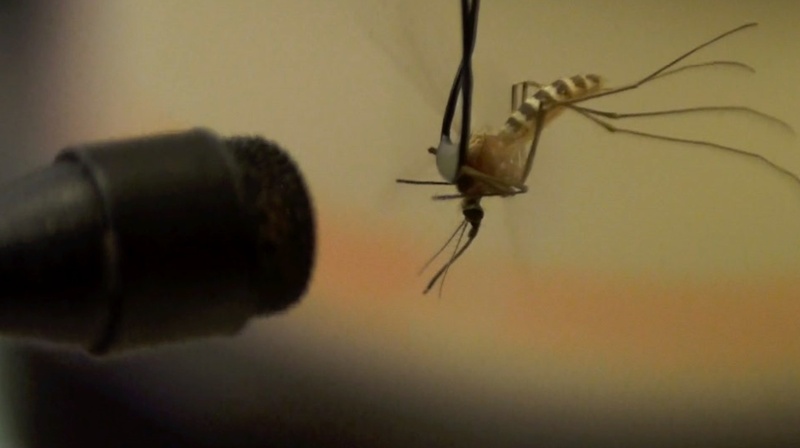 Subsequently, the computer sings a third voice that responds to the musical inflections of the mosquito's buzz. 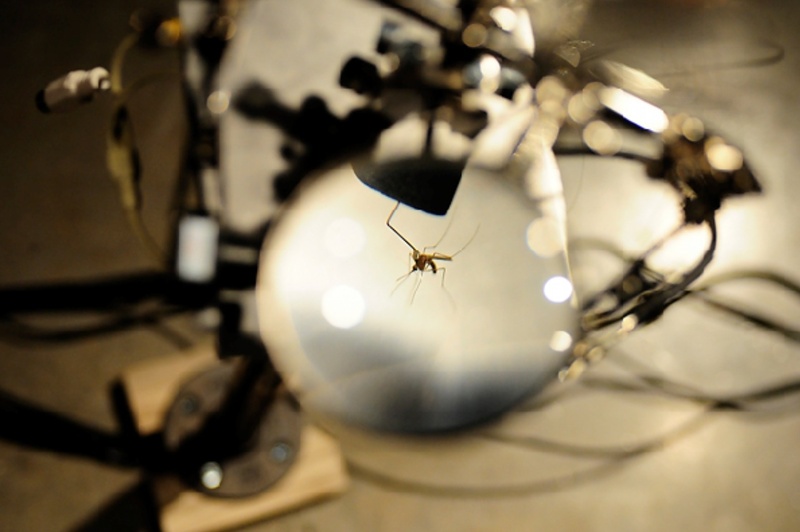 These three voices come in and out of harmony depending on the mosquito's propensity to maintain its sync with the stimulus signal. 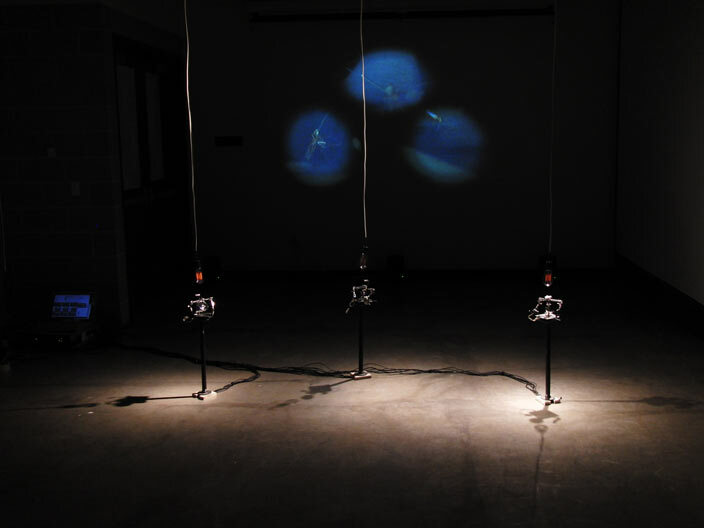 In our installation, each mosquito is equipped with a loud-speaker for providing the stimulus signal, a sensitive microphone for picking up the mosquito's buzz, a camera for giving us a closer look at the insect, a kinetic component that allows the mosquito to rest every few minutes, and a light bulb that shows the mosquito's activity. 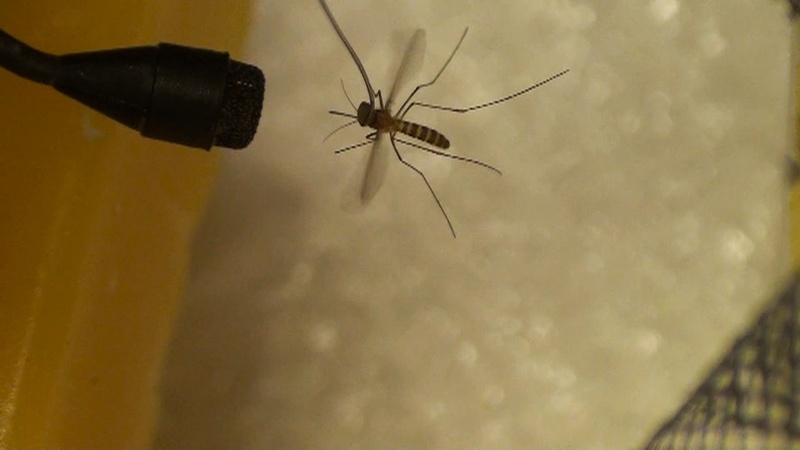 Offering a finger tip for the mosquito to land: slowly approach the mosquito from below and stop about 1/4 inche away from the mosquito. 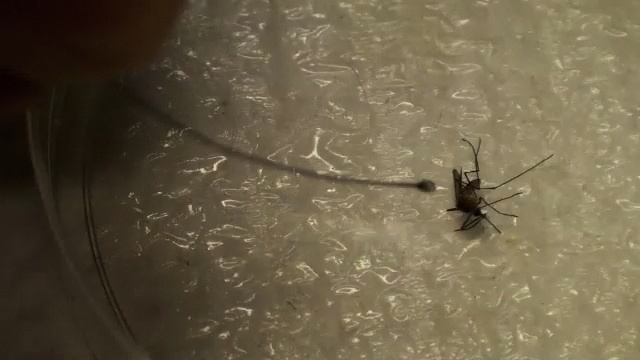 The mosquito will recognize the landing spot and extend his/her legs to reach you. 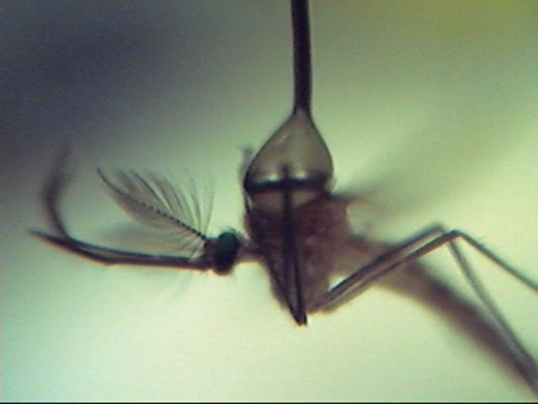 Exhaling on the mosquito: the carbon dioxide in our breath excites and entices the mosquitoes. 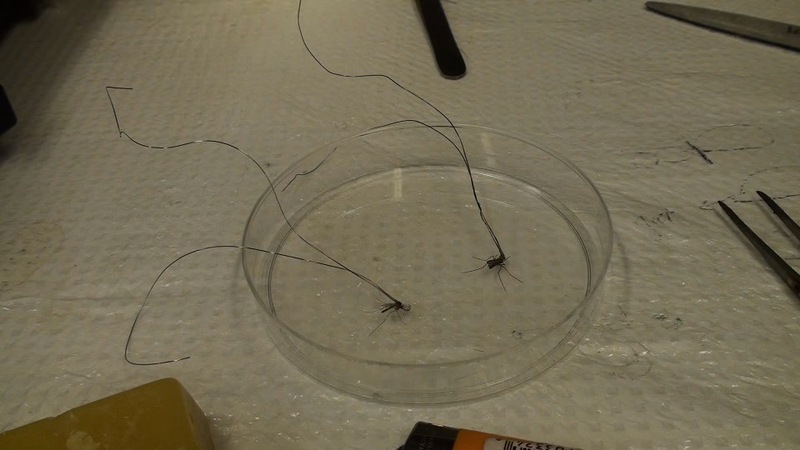 Please avoid applying pressure to the mosquito, touching its wings, or touching the wire to which the mosquito is attached. 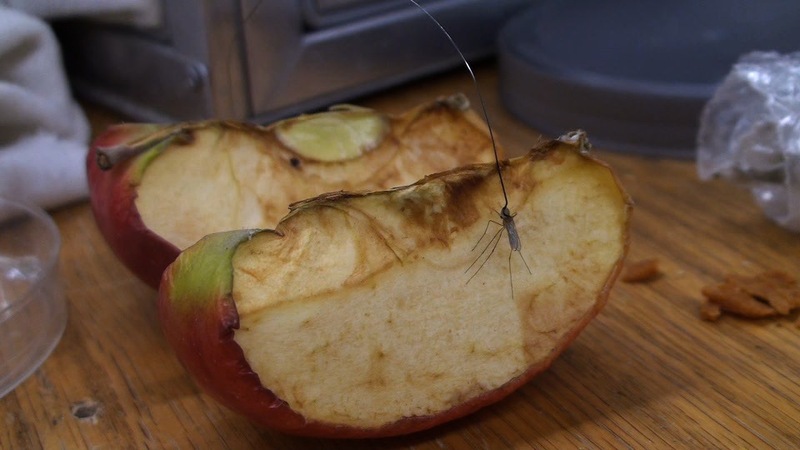 These actions can hurt the mosquito, free the mosquito or produce undesirable sounds. We wish to give special thanks to Ann Fallon, a researcher at the University of Minnesota. 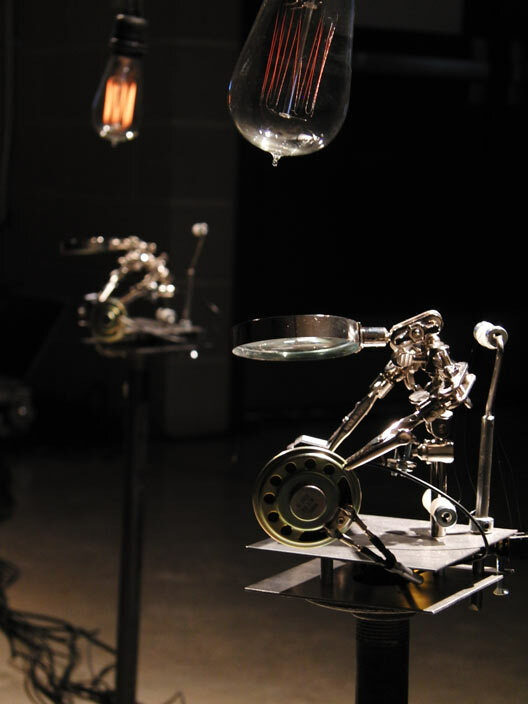 Without her generous offer of the facilities and mosquitoes of her St. Paul laboratory, this project would not have been possible. 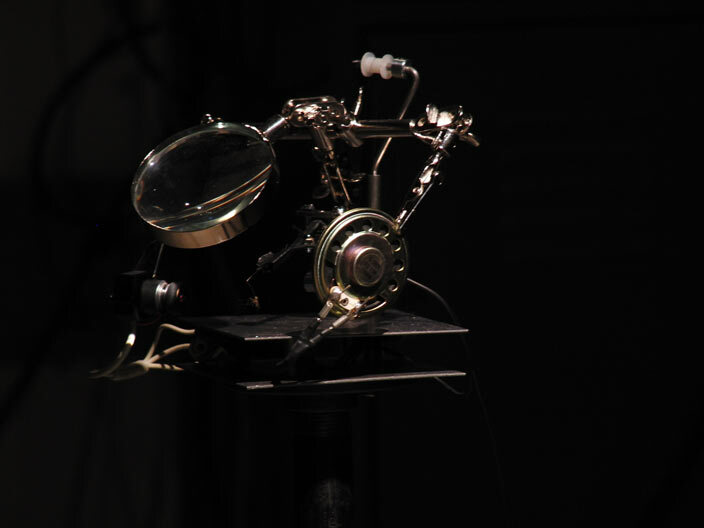 We also wish to give thanks to Andrea Steudel for her excellent documentation work (higher quality video is available here).